A waddle of penguins is a term of venery decided upon not by medieval writers or 19th century philologists, or even 21st century Internet enthusiasts or gallery owners, but rather by international bureaucrats meeting at the Fourth International Penguin Conference in 2000. The term, uniquely, is "official" when referring to a group of penguins on land. By contrast, penguins in the water are more properly referred to as a raft. The use of raft for any of the approximately 20 penguin species found in the subfamily Spheniscinae is extreme common, reaching almost one-half million online, though waddle achieves just short of 30,000 search results. The noun of assembly parade, which too imagines these aquatic birds walking officiously by, manages to edge out the officially sanctioned waddle by a couple thousand results. The term rookery continues to refer to penguins on land with far more frequency than the official term waddle. The former term goes back to no later than the New English Dictionary (1702) at least with regard to rooks. Rookery now more expansively encompasses any "breeding ground ... especially of gregarious birds or mammals." Thus while waddle might refer to the March of the Penguins, a rookery might refer to penguins once sedentary as they nest. Much less frequent, though semantically similar, is the lyrical term crèche. Other sturdy possibilities for spheniscine groups, while common, are likewise not limited to penguins or even to birds. A colony is "a group of plants or animals living or growing in one place," while a huddle is a "densely packed group or crowd, as of people or animals." Given the nesting behaviors of penguins, these last two terms often, though not always, serve similar purpose as rookery when used as collective nouns. Alon Shulman in his book Mess of Iguanas, Whoop of Gorillas: An Amazement of Animal Facts (2009) offers explanations for two more related terms used to describe groups of penguins: passel and parcel. Shulman correctly notes that there confusion reigns as to the origin of these terms, and which represents the more "authentic" term. Without specific citation, he throws his weight behind passel, recorded as a variant for parcel in 1834, contending that it is an "informal American term" for groups of things and people, that American sailors applied the term to penguins, and these passed "into the record" as "parcel of penguin." Shulman notes too that Shakespeare himself used the "parcel" collectively (a "youthful parcel of noble bachelors," All's Well That Ends Well, Act 2, Scene 3), and by turns draws an analogy between troops at attention and penguins standing in their finery on shore. However, there is some evidence that "passel" predates 1834, and was used regionally in Britain. In the absence of any printed references from the 19th century, British or American, it is difficult to make a dispositive determination. But all the same, Shulman has given us the perfect continuing valid use for passel and parcel, even in light of the official term waddle: Penguins standing, as if at attention. The first published occurrence of waddle dates from 2004 in a book for children entitled, ironically, A Rookery of Penguins, in which authors Richard and Louise Spilsbury note that "some people call a group of penguins a waddle because of the way they walk." The term "waddle of penguins" was first used in a non-childrens book fours years later in the Visual Atlas of Korea: 2008 Map & Guide when describing exhibits at the Pacific Land aquarium. 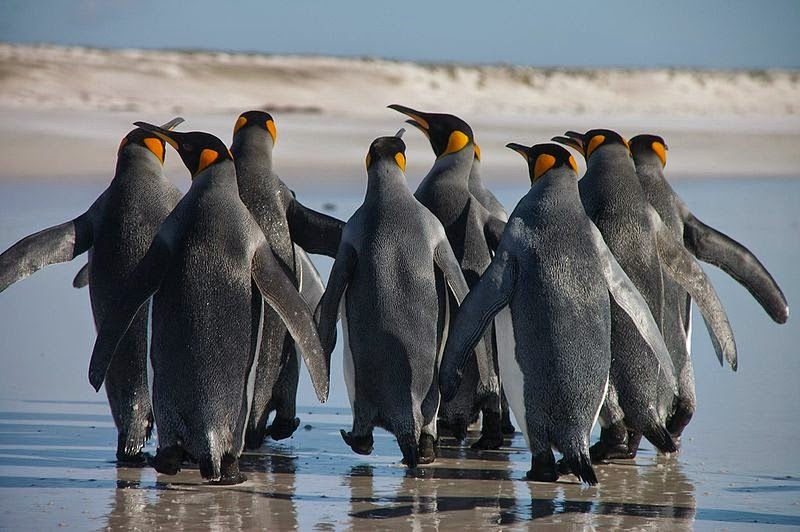 Even scientific literature, though not referring to groups of penguins, refers to the "stiff-legged oscillating gait" of these birds as the "waddle of penguins." Surely the word captures something singular and naturally descriptive about them even in the midst of so very many existing alternatives. Significantly, pingouin refers instead to either the razorbill (Alca torda) or the extinct great auk (Pinguinus impennis).